The group surrounding the German bandleader and flutist Dieter Weberpals plays intoxicating folk music for cosmopolitans. Between Trance-Grooves, West African poly-rhythms, Zagazougou-accordion, Oriental ballads and Balkan-dance all flavored with a dash of Jazz, Argile establishes ties within the difficult cultural environment stretching between Africa, the Orient, and Europe. The German daily Nürnberger Nachrichten describes the strength of Argile as being, on the one hand, its good musicians and on the other the concept of the music itself. It doesn’t turn European and African elements into a tasteless pablum – it preserves the distinctiveness of both. In the USA, ethnomusic-specialist Michael Wall describes Argile in simple terms: Herbie Mann meets Mamady Keita. 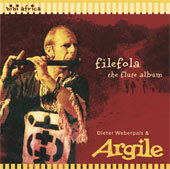 And sure enough, Filefola (Bamana-language means in English “flute-player”) flutist Weberpals’ music is reminiscent of this great American flutist’s work. But with Kinkeliba even Jethro Tull fans can find a song on the current album they are sure to like and is a potential hit - Locomotive Breath with an African touch. Track 2 Ouasolo / Saluts à Barry is dedicated to our friend and former band member - Barry Sangare - who was a major contributor on Argile’s first three albums. Following a major brain hemorrhage in 2001, Barry remains partially paralyzed and can no longer play his fine djembe grooves and n’goni melodies. Dieter has composed his flute and djembe playing around a sample of Barry’s voice for a new interpretation of an ancient recording of Ouasolo. Ten percent of all sales of this CD will help Barry by giving him the freedom to travel outside the bounds of his care center to visit family and friends.